Getting dinner made and served can be a challenge. Every evening we face obstacles such as children’s activities, work crises, and traffic. Take-out can be a quick answer, but it is expensive, can be unhealthy, and still requires a trip in the car. Short of adding an extra hour between 5pm and 6pm (still working on that one! ), the best solution is to get this daily function as organized as possible. There are many blogs full of ideas on what to make, but here are a few tips on how to establish an efficient system. 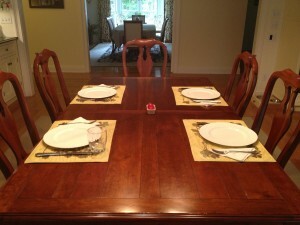 While family schedules vary day to day, it is still helpful if there is an expected dinner hour. Yes, you may need to adjust it for a late practice/rehearsal/meeting, or perhaps feed one family member at a different time, but predictability makes meal preparation easier, and encourages family members to arrange their schedules around you. Make a list of meals you would like to serve during the week. Invite family members to help by sharing their ideas. Plan for differing family configurations (such as “kids only” or “Dad’s away”.) Put a notation next to each meal on your list so you can remember. Make a shopping list. Although this step is tedious, you can’t prepare meals if you lack the ingredients. If you buy groceries in different stores (e.g. a regular grocery store and a wholesale/big box store,) keep multiples lists. You can do this on paper, or keep running lists on your phone. Plan to visit your regular grocery store at least once a week. For wholesale groceries, you may be able to visit less frequently and stock up. Consider an online delivery service, such as PeaPod by Stop and Shop. This can be a great alternative for the basics you need every week (e.g. drinks, soaps, cereal) and you can select a delivery window that is convenient for you. Having the large/heavy/common needs delivered will minimize the time you need to be in the store for specific menu needs. The crunch of dinner preparation is largely time-based… we just get very busy at this time of day. Therefore, it helps to do as much as you can before the evening rush. Set the table when YOU have time. The table can be set for dinnertime at 7am if this works for you, especially if you have the luxury of having a dining surface that doesn’t need to double as a work surface. If you need to work on the kitchen table, assemble a tray that has all you need (placements, plates, silverware, napkins, vitamins, glasses, salt and pepper, etc.) so the task will be quick and easy. Most meals require at least some chopping, measuring, etc. Do this when you make breakfast, during naptime, or whenever you have time. Think how quickly meals come together on TV when the chef has everything pre-measured! Prepare items that will be served cold (e.g. salad), cover and put in the fridge. When dinnertime arrives, dress the salad and go. Consider pre-cooking some items on the weekend (e.g. a favorite sauce or chicken breasts.) There are many websites with ideas on cooking ahead. Having part of the meal already made can make assembly much quicker. Invest in a slow –cooker for those nights when you will be walking in the door at dinnertime, or when family members will be eating separately over a multiple-hour timeframe. If you have a full life, there will always be nights when it feels like making & serving dinner is a challenge. But a little planning can ease the process so that dinnertime can be a positive part of your day. Project Eve is an online community that challenges and inspires a new breed of innovative and creative women who are actively reinventing their careers and with it the future of business. Our contributors come from a wide range of backgrounds; so whether you are a female founder, a marketing strategist, a financial adviser, or an amateur blogger we urge you to consider contributing a relevant article to our community today. All published content will be syndicated to over 300,000 friends, fans and followers. Project Eve welcomes submissions of original or republished content. For more information, please refer to our Content Submissions Guidelines.